Saxophonist “Captain” Carl Conley brings his Quartet with Dave Powers on keyboard, Louis Tsamous on drums and Dennis Hodges on guitar, to the Troubadour Club this Saturday, November 16th at 7pm. 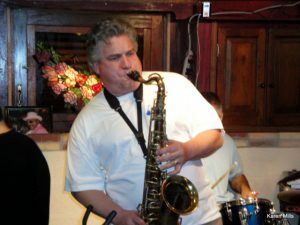 Carl has studied with many notables but is best known locally as the protégé and lifelong friend of the legendary Gene “King Sax” Walker, one of the best saxophonists/educators/bandleaders in Central Ohio. Carl has performed with the late Leroy “Hog” Cooper (who was with Ray Charles for 25+ years), “Honeyboy” Edwards, Bo Diddley Jr., Joe Weaver and Lou Donaldson. Locally, he has collaborated with blues-man and “little brother” Sean Carney whom he sponsored at the 2006 International Blues Competition in Memphis’ famed Orpheum Theater, and with the late Willie Pooch who stole the show at the 2008 two-day Blues on the Green Festival also produced by Carl. Carl has the tone that reminds me of jazz greats like Dexter Gordon, Illinois Jacquet and the wild man of Texas, Arnett Cobb. He has that undefinable sound that earmarks a jazz man.